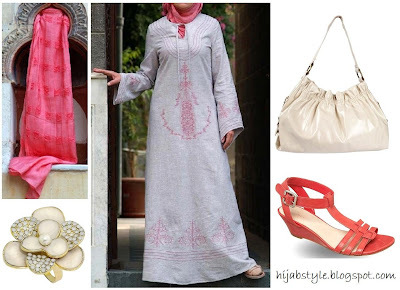 Linen Shangri-La Dress £48.95; watermelon crinkled wrap £3.95, both Shukr; enamel flower ring £12; cream ruched buckle bag £20, both Dorothy Perkins; pink sandals £55, Nine West. Hi Jana! Loving ur blog...please could do a section on how to use flower corsages etc to jazz up a hijab? Its too confusin trying to make the hijab fabric into a flower so could you show how to use the corsage brooches to make it look good? Thanks! I was looking for some HIjab styles and stumbled on your website. I am in the US and noticed you have someexcellent range of Islamic Clothing in the UK. I recently ordered from this website www.eastessence.com and Mashallah they have some very beautiful Abayas and Tunics. They do not have too many Hijabs currently but as per them they will be adding a few soon. Their prices are the best I have seen. You may want to put a note on them for our Muslimah sistes in UK. I think theyu ship International. Also please keep this blog going. I love the styles and links you keep posting here.